Efforts to commercialize agriculture in peasant societies through investments in technology and various pricing strategies have failed to create the food surpluses needed to forestall famine and support industrialization in East Africa. Seavoy explores this problem, basing his study on the case of Tanzania, a country that experiences recurrent peacetime famines associated with failures in subsistence agriculture. Providing an analysis of East African subsistence culture, he investigates the failures of national agricultural policies and defines strategies for inducing subsistence farmers to shift to commercial production. Seavoy looks at various development initiatives involving technological inputs, political pressure, taxation, and land tenure provisions and their effects on the political economy of subsistence agriculture. He presents a detailed survey of subsistence culture, its agricultural and pastoral practices, and such variables as labor, topography, rainfall, and population density. The shaping of the East African political economy under colonial rule is discussed, together with the economic, social, and political legacy that has persisted to the present day. 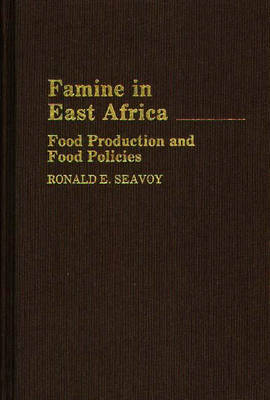 Seavoy examines Tanzanian agricultural policy, which has aimed at facilitating the transition to commercial agriculture. He finds that the country is a long way from achieving the assured food surpluses that would enable the nation to support an urban industrial workforce. Among the underlying causes he notes the continuing population explosion, the farmers' objections to commercialized agriculture, and deficiencies in the physical infrastructure, trained personnel, and political institutions. He argues that surpluses will not be created until political leaders use the power of national government to enforce the shift to commercial production. A noteworthy and original contribution to development literature, this work is relevant to studies in modern political economy, Third World development, agricultural economy, and related disciplines.